Almost every day I receive a new flower for my ‘Flowers of Friendship’ hanging – some are hand-delivered and some come in the post. It is so exciting! I feel truly blessed that so many people are contributing to this project. Some flowers are from people I have never met, and some are from interstate. I am absolutely blown away by people’s talents, their generosity in donating their own materials and their willingness to spend so much time creating these wonderful blossoms for me. These are all the ones I have received so far, and I know many more are on the way. Some of them are now on display until the end of April at Corinda library (Oxley Road, Corinda). * Corinda library (641 Oxley Road, Corinda). for school-aged children, (and young-at-heart adults), free, no bookings required. 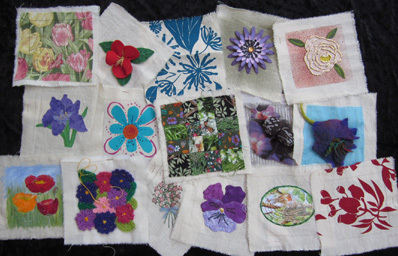 One of the collaborative projects I am planning is a wall hanging entitled ‘Flowers of Friendship’. In February I asked my friends to make a flower to fit within a 10cm square. These will be joined with strips of fabric (with lettering!). Because I am a member of many different craft groups, I had hoped to get flowers made in a range of different techniques, but I wasn’t expecting such variety and skill level. The ones I have received so far have exceeded my wildest imaginings! These are the first ones I collected. Aren’t they truly gorgeous? Well it is now March, and I did say in my previous post that I would begin working on some collaborative projects! On the first Tuesday and third Monday every month at the Gardens, you are very welcome to watch these creations unfold as I work (and play) with my friends. My friends Lyn and Sue are joining me to explore a range of textile techniques. These will be incorporated into a forest scene which will be on display in my November exhibition. At our first ‘play day’ we decorated many different fabrics using Shiva Sticks (oil-based fabric crayons). We created some great leafy and bark-like textures by rubbing over textured surfaces. We also stencilled and drew designs on fabric. Here’s a future challenge for all my readers … and you will need to remember this until November! When you see our completed 3D hanging, if you can recognize any of the pieces in this image (above on the right), the first person to point them out to me will win a prize! Please come and watch us at our next ‘play days’ as we make more additions for our collage. We will be working in the Auditorium at the Gardens on 19 March (silk painting) and 3 April (wet felting) and 1 May. See some of my other work on display, talk to me about the residency, and maybe even purchase some of my small works (prices start at $2).